Invite friends, add nature and you’ve got the makings of a great birthday party! 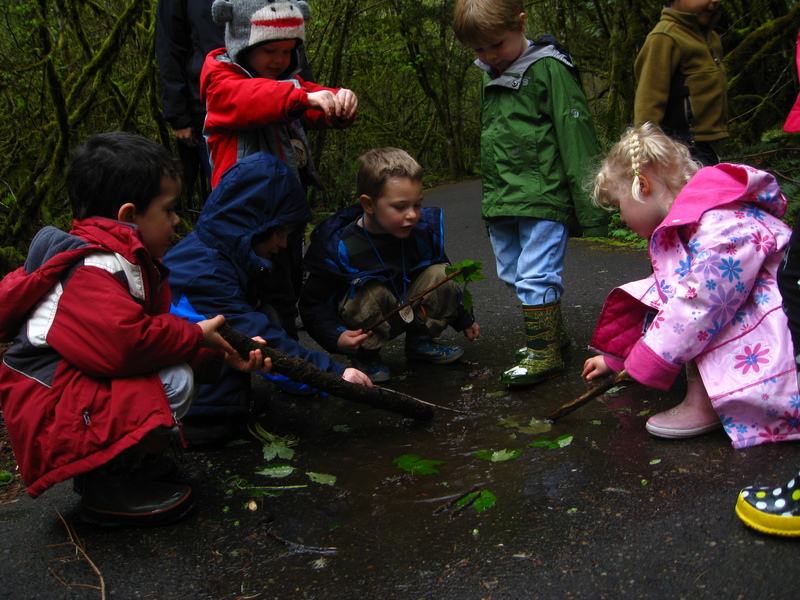 Tualatin Hills Parks & Recreation District offers guided nature-based birthday party packages! For up to 12 children, ages 3-12 years old, celebrate your child's birthday in nature at Tualatin Hills Nature Center and Cooper Mountain Nature House locations. Want to stay in your neighborhood? No problem - We will come to you! Choose your neighborhood park. We provide kid-sized tables and chairs, additional seating for adults, and a memorable one-hour naturalist-led program of your choice. You bring the cake, drinks and paper goods. The party room is yours for two hours, which includes the program time, with additional 15 minutes before and after for set-up and cleaning. Check out our programs below. Explore the park as we look for some of the world’s smallest residents. Armed with nets and magnifiers, we will search for spiders, slugs, beetles and other invertebrates. Availability: April through October (ages 5-12). Calling all superheroes! Did you know that the plants and animals in the nature park have superpowers too? Learn about the different kinds of heroes that work in our parks and how they help protect our environment. Birds are unique in many ways. Learn about what makes a bird a bird, what they eat, and how they build nests. Head outside to look and listen for birds in the park. Join Jerry, our resident gnome, on a quest to find the fairies, gnomes, and other magical creatures living in the park. Also learn how fairies and gnomes live together with their feathered and furry friends. Discover mammals big and small, as we examine their bones and pelts to figure out how their adaptions help them survive in the park. Investigate the interactions between predators, like coyotes, and their prey. For generations, the forest has been a source of wonder and inspiration. Join us on a journey as we unearth amazing tales about the plants and animals living in the forest. The Robin's Nest is an intimate room with sinks, plenty of counter space, and windows looking out into the forest. Maximum capacity 24. The Beaver Den can accommodate a larger party of children and parents with a full kitchen and a view of our courtyard and forest. Maximum capacity 50.
Cooper Mountain Nature House is located at the entrance to the Cooper Mountain Nature Park, a 230-acre property with three miles of trails and a variety of habitats, some of which are unique in our region. The Nature House space has a sink, counter and microwave, and features spectacular views of the park's prairies and the Tualatin Valley. Maximum capacity 40. Neighborhood Parks: If you are interested in taking your party outside, please visit the Find a Park tool to discover a THPRD natural area near you. Prices include up to 12 children, 2 hours of private facility rental for your party with an additional 15 minutes before and after, room set up (tables & chairs) and a 1-hour naturalist-led nature program of your choice. All package prices include up to twelve youth participants. An additional staff member will be required for parties with more than 15 youth participants (and up to 24) at a fee of $50. A $50 nonrefundable deposit is due at the time of reservation and is put toward the total amount. Balances are due 10 days prior to the event. Parties can be scheduled up to 4 months in advance. Parties tend to book quickly, so we advise you to give us as much prior notice as possible. Our staff is happy to check availability, answer questions, and schedule your birthday party! Please email or call Tualatin Hills Nature Center at 503-629-6350.